Higashi-Matsushima city major Hideo Abe shows off pictures of the city's reconstructing plan after March 11, 2011 earthquake and tsunami disaster, at the city government office in Higashi-Matsushima, northern Japan, February 22, 2017. 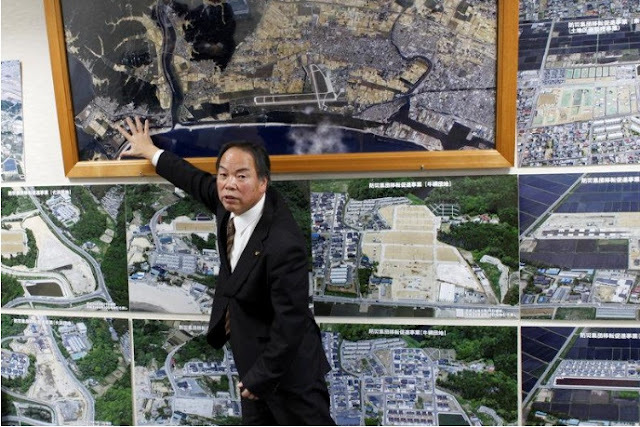 TOKYO/HIGASHI MATSUSHIMA, JAPAN - A northern Japanese city’s efforts to rebuild its electric power system after the 2011 earthquake and tsunami mark a quiet shift away from the country’s old utility model toward self-reliant, local generation and transmission. Sekisui House, Japan’s biggest builder of detached homes, constructed Higashi Matsushima’s smart micro-grid for 85 housing units in 2016. Taisei Corp, one of Japan’s biggest construction companies, set up an energy strategy division this year to take advantage of the drive for smart energy systems.